Nothing can make a parent more nervous than a sick child. Often, children develop a cough when they are sick and the cough usually goes away after the end of the illness. Dealing with chronic cough in children can really make a parent uneasy when a noisy cough does not seem to go away. However, coughs are most often not serious and necessary to help keep the airways open. Here are some common causes of chronic cough in children and what you can do at home for relief. Your child may have a loud hacking cough. This is a sign of either an illness, object in the airways, or something irritated the lungs. Below are a few of the most common things that cause chronic cough in children. Irritants – Secondhand smoke, household cleaners and exposure to fireplace smoke can cause a chronic cough in children. Pet dander, excess dust and dirt in the home can also irritate a child’s delicate airways. Air pollution can also be a problem. Illness – A viral or bacterial upper respiratory infection can also cause chronic coughing for children. Influenza causes a long-term cough, colds usually cause milder short term coughs, but croupy coughs are loud and barking. Allergies – Allergens can irritate the airways and cause coughing. These can be seasonal due to blooming near the home, allergies to pets, or food based allergies. The cause can usually be found with allergy testing. Asthma – A cough with asthma is usually accompanied by wheezing in the chest. It worsens during the night and periods of illness. Some kids experience severe wheezing and trouble breathing with exercise. Pertussis/Whooping Cough – This cough sounds just like its name. It starts with cold-like symptoms, including low grade fever, sneezing, runny nose and then progresses to the loud coughing spells. It is a bacterial infection, but there is an immunization to prevent it. Reflux – The acid in a child’s stomach can come back up into the throat and cause a cough which could persist for quite a long while. Reflux is usually accompanied by vomiting, heartburn, and they complain of a funny taste. It is usually triggered by certain foods like mint, chocolate, greasy foods and sodas. Objects – Small children can inhale foreign objects into the airways. This can cause them to cough to try and dislodge the object. It can also happen with small food particles. Certain toys could be a danger as well as foods like peanuts, grapes and raisins. Sensitivity – There are cough receptors in the body that can be more sensitive to certain things. This is still under research, but inflammation of the airway or sensitivity to a particular irritant may be a cause. One more sensitivity is the smell, which may not cause others to cough but may cause persistent or chronic cough in particular children. Ototenic – A nerve in the ear canal can cause coughing when it is touched. Things like ear wax in the ear can irritate the nerve and cause a persistent cough in children. Parents may also notice this reflex when cleaning their child’s ear with a cotton swab. Habit – Some kids may just cough, to cough. It could be a psychological issue or continued cough after an illness. These coughing spells are dry, loud, and seem to be attention seeking. The child does not seem to be ill or bothered by it. Doctors usually do not find a cause and if it persists too long, counseling may help curb the behavior. Humidity – You can try a cool-mist humidifier to help relieve a dry hacking cough in children. Steroids – With croup, the doctor may prescribe a steroid to help relieve the inflammation in the throat. This is usually dexamethasone/Decadron. Antibiotics – If the doctor believes the infection is bacterial, they will prescribe antibiotics. These treat sinus infections, bronchitis and pneumonia. 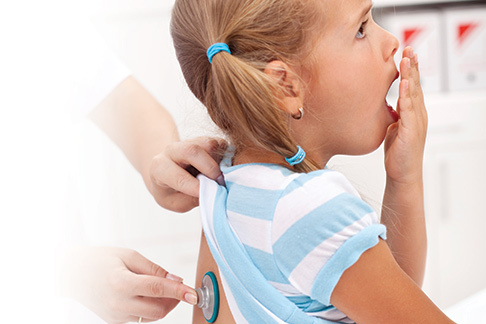 Inhalers – If your child has a wheezing type cough, the doctor may use an inhaler to help open up the airways. Bronchoscopy – If the cause of the cough cannot be found and is continuous, the doctor may do a bronchoscopy to look for an object that has been inhaled into the lungs. Acid controlling medications – The doctor may prescribe a histamine blocker to help control acid reflux from the stomach. They may also advise thickening infant formula to prevent reflux. Salt water gargle – Salt is a very good natural anti-inflammatory. When you gargle, it pulls the water out of the tissues in the throat to relieve the inflammation and swelling. Salt water can also help to wash out excess mucous. Steam – Steam helps to make persistent coughs more productive by thinning out the mucous. You can also place helpful oils in the water that can help the illness. Tea tree and eucalyptus oils have wonderful healing properties for coughs. Thyme tea – Thyme has been found to help calm the muscles in the throat and relieve coughing. It can help the airways open up and may have anti-bacterial properties to help the body fight off the infection. Peppermint/Ginger cough syrup – Not only is ginger known for its ability to soothe, it is also an expectorant that can thin thickened mucous. Made into a syrup with some peppermint oil, it can sooth the tickling sensation in the back of the throat to quiet coughing. Medical recommendations state that over-the-counter type cough medications should not be used to treat chronic cough in children if they are under age six. Any cough and cold medications sold without a prescription can contain substances that cause side-effects, including depressed breathing rate, insomnia, hallucinations or allergic reactions. These medications have not been found to be beneficial for coughs in children under six. If your child is older than one year, you can make a cough syrup from honey and lemon at home. Honey cannot be given to babies under one year because it can cause botulism, an infection that affects the breathing and nervous system.